This documentary examines the variety of pressures that threaten the health of western rangelands, including population growth and development and the interrelated effects of climate change, wildfires, and invasive species. The program takes viewers to locations around the West where ranchers, conservationists, and public land managers are turning to a legacy of the frontier — livestock grazing — to help conserve the rangeland ecosystems. The varied ecosystems we call rangelands comprise one-third of the entire country and more than half the western U.S., yet the American public is generally unaware of the critical contributions of rangelands to many public interests and values. A critical need exists to provide credible, factual and clear facts to educate a minimally informed or misinformed public regarding the value of rangelands, natural resources and sustainable multiple use of these resources for the benefit of society. In addition, this production is now available to national PBS stations through an ACCESS satellite uplink effective Saturday June 18, 2011 for a period of three years. This is being made possible through support of the National Educational Telecommunications Association (NETA). 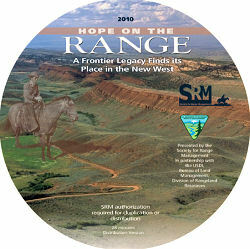 Hope on the Range is available in two versions. If you would like to see the 9 minute version, please, click here. “Hope on the Range” is the product of exhaustive research and scores of interviews with academic and scientific experts, conservationists, ranchers, and other stakeholders. It is designed to dispel myths associated with stewardship and use of western rangelands, promote the multiple use concept of public lands management and advance the idea of the interdependence of public and private rangelands. We believe it represents a well-balanced and objective examination of a very timely and important public policy issue. This documentary specifically focuses on livestock grazing and how this legacy of the frontier has evolved from a practice that was once considered a detriment to the health of the land, to a practice that today can be used to promote healthy rangelands and conservation values. For your reference, this theme was echoed in the article “How to Save the Grasslands: Bring in More Cattle”, Time Magazine/CNN, September 7, 2010. As the documentary unfolds, it explores several case studies that highlight the use of ecologically-sound grazing strategies, the regional economic benefits of grazing and the social benefits of grazing intertwined in conservation efforts. The “Hope” of the program embraces the hope of ranching families to preserve a traditional way of life, the hope of communities to preserve their social fabric and existence and the hope of many that rangelands can be managed sustainably and preserved as our legacy to future generations. View Our 9 Minute Video! We believe it is the hope of all citizens that the magnificent landscapes and great open spaces of the American West can be preserved as our legacy to future generations. We also hope that these lands will continue to be managed for multiple uses and values that benefit conservationists, recreationists and other public rangeland users. The video discusses livestock grazing and its contributions to a variety of important public interests and values, including: the health, diversity and productivity of the rangelands; the quality of water resources; the health of habitat for diverse native species of plants and wildlife; the ability of rangelands to withstand noxious weed invasion and the impacts of wildfires; and the preservation of open spaces in the face of a growing human population and increased urbanization of the American West. A limited number of DVDs are also available for those that are interested in having a copy. Please feel free to forward any comments or requests to: Society for Range Management 6901 S Pierce St STE 225 Littleton, CO 80128 P 303-986-3309 F 303-986-3892 email: info@rangelands.org. Thank you!